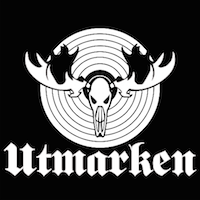 UTMARKEN, is a new band from Sweden; they released their self-titled debut album in early 2016 via their own label. Entering the Swedish Metal Folk tradition, the band gives a complete real folk metal work with great Folk melodies and suave keyboards phrases. Very interestingly, all the titles of songs and the lyrics are entirely in Swedish; many original and traditional Swedish sounds have been used also in the harmonies and the melody. At moments it reminds of melodic metal, some MOONSPELL tunes comes to mind over some orchestration. Mathias, the lead singer, has a clear nice tone of voice with plenty of strength, and some of his style remembers progressive rock. “Strömkarlens Son”, the opening track of the record, makes very clear what UTMARKEN is all about: great choruses, epic ambient, prominent violin and a precise and tight production. These elements are strongly presents in the second track “Valkommen Till Norrland”, with a beautiful violin intro and solo break through the tune. In this track, we find a true anthem with its alternation between vivacity and gloomy feelings, with epic choruses, and it captures particularly the style of UTMARKEN. The record continues steadily with great production and orchestration throughout the album, although perhaps a bit flat in its rhythms. The tunes are kept short to 3-4 minutes each. We arrive then to one of the best pieces of the album “Bleka Toner”. This is a total sing-a-long track, from the very first note Mathias entangle the listener with a beautiful chorus, the rhythm changes here give also a bit of spice compared to the other songs. If you are a fan of Folk Metal you will definitely like this album. And you are in for a double treat as UTMARKEN has already announced that they will release a second album in 2017!